Of all the many things to do in York, this is probably top of the list. It is certainly the top of this list!. York Minster is the largest Gothic cathedral in northern Europe and it is a truly spectacular place. It houses some fine stained glass, including the magnificent Great East Window – the size of a tennis court and one of the greatest examples of medieval art and craft in the world. You can explore the Roman remains, upon which the cathedral was built, in the Undercroft, or climb the central tower for spectacular views over the ancient city and surrounding countryside. Visit the York Minster website for more details. For more information on The Shambles visit the website. This small but majestically landscaped garden and park, within the city walls, lies close to the river and contains many interesting diversions. You can roam over the haunting ruins of St. Mary’s Abbey, dissolved by Henry VIIIth; gaze upon the lovely 14th century Hospitium; discover everything about Roman York, and far more besides, in the Yorkshire Museum, housed in a grade I listed building; or relax in the newest addition to the gardens, a new cafe/bar/restaurant serving great food overlooking historic Lendal Bridge. 4. York’s City Walls – one of the best free things to do in York! 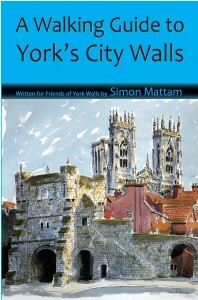 Also know as the Bar Walls, York has an almost complete circuit of defensive city walls encircling the city. It’s free to walk on the walls and there are numerous entry/exit points. A popular starting point for a walk around the Walls is at Bootham Bar – one of the gateways into the city – which is located very near York Minster, and opposite York Art Gallery. If you don’t want to walk the entire route of the Wall, then this section that goes behind the Minster is very short but with lots to see – including the Minster itself, from sides that cannot be seen elsewhere. Be sure to check out our walking guide for the city walls – it’s like having your own personal tourguide on hand, to tell you all of the secrets and history as you go! There are many other things to do in York – watch this space for further posts. Posted by YorkTalk on June 14, 2014 in Things to do in York.